How does a Pulitzer Prize prizing winning play written several years ago simply become more and more relevant since it was first produced? Is it a case of life imitating art? 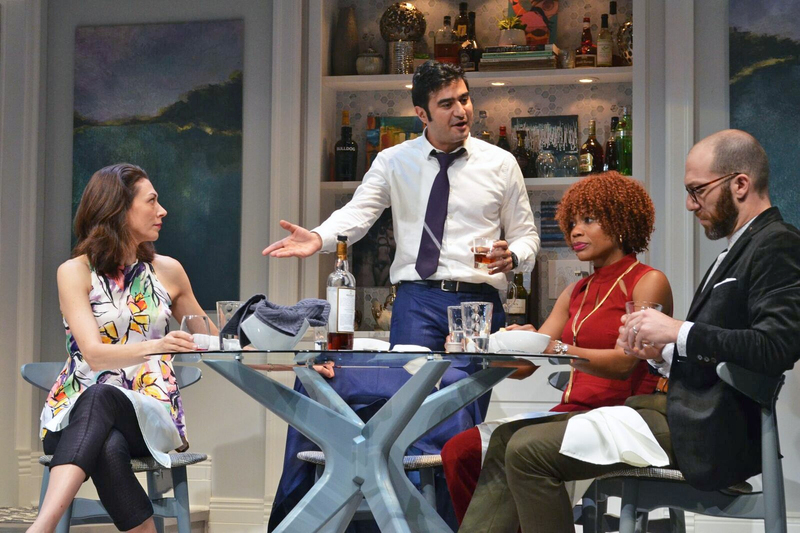 Here is a play about an upcoming corporate lawyer, Amir, attempting to become fully assimilated into the cultural circle of professionals, to distance himself from his Muslim heritage through marriage and lifestyle, only to watch that façade implode. 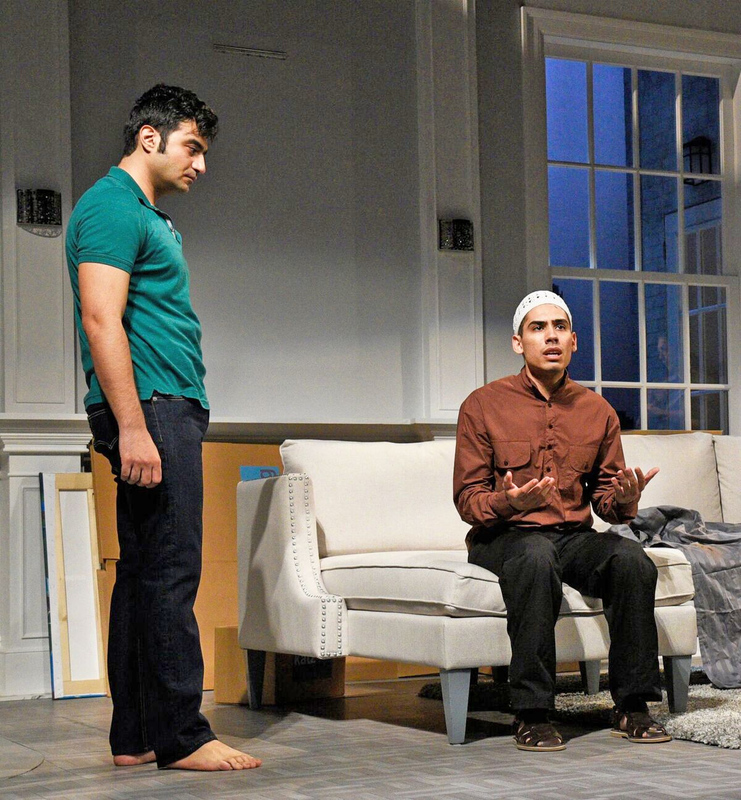 The unseen element in the play is the current political environment, the result of a campaign full of invectives directed at, among others, Muslims, and the resulting highly contested “Muslim travel ban” and reports of illegal Immigration and Customs Enforcement roundups and deportations. 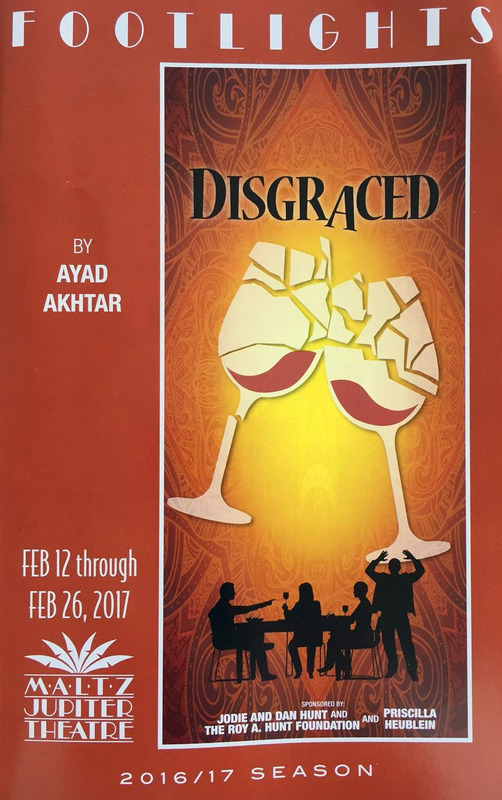 Playwright Ayad Akhtar might not have fully foreseen these extreme events when he wrote Disgraced, but after 9/11 he knew the xenophobic direction it was taking us and its impact on a man of Islamic heritage. Amir (Fajer Kaisi) and his wife Emily (Vanessa Morosco) are pursuing the classic American Dream, living in a sophisticated Upper East Side apartment, obviously possessing the resources to enjoy their professional lives. The set by Anne Mundell and the lighting by Paul Black telegraph Manhattan power couple. It is a crisp, contemporary setting with a view of the Manhattan skyline from their balcony. Emily, an artist, accepts this behavior as perfectly normal in her volatile husband who in turn is amused by and tolerates her latest passionate love for Islamic Art, something acquired during their travels in Moorish inspired Spain. While he mildly encourages her latest works, it is also clear that he is not happy about this obsession. Vanessa Morosco as Emily is a highly accomplished actress who portrays a striving artist waiting for her first big show, a wife devotedly in love who never fully grasps her husband’s deepest insecurities and secrets. Amir’s nephew, Abe, sensitively played by Eddie Morales with wide-eyed adoration of his uncle is disturbed that a local Imam has been falsely imprisoned. He feels this is politically motivated, and the manifestation of growing Muslimophobia. He comes to his Aunt and Uncle for their help. Emily urges her husband to lend his professional legal advice. He loves his wife and reluctantly agrees. Eventually there is a trial. However Amir’s name is mentioned in a newspaper article about the case although he wasn’t acting on behalf of the defendant, but suddenly his firm is aware of his Islamic background, something he has conspicuously hidden. The stage is set for a developing train wreck of a “dinner with friends,” one Emily gives for Isaac (Joel Reuben Ganz ) an art gallery owner who wants to exhibit her work and has more than a professional interest in, and his wife, Jory (Chantal Jean-Pierre), who coincidentally works with Amir in the same law firm. The evening devolves into an increasingly revelatory and combative conversation between a Muslim (albeit assimilated), a Jew, the African-American attorney and a WASP, where Amir has to confront himself and his apostate views. Both Joel Reuben Ganz and Chantal Jean-Pierre as the interracial couple give outstanding, persuasive performances, Ganz a credible foil to Kaisi’s Amir and Jean-Pierre's Jory providing some well timed comic lines. She comports herself with the precision of another professional on the move to corporate greatness. The pot is stirred with a boiling brew of high voltage issues, religion, the clash of cultures and civilizations; Christian, Judaic, and Islamic, as well as the volatility and infidelity of both marriages. 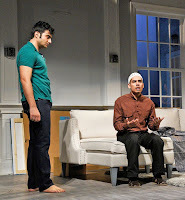 With the help of the ubiquitous truth-teller, alcohol, Amir, who is already feeling deeply abased by his law firm is steadily driven into the recesses of his ancestry to the point of uttering the unutterable, that the crucible of 9/11 gave him some secret satisfaction; it is a pin-dropping game changer in the play. Although he defends the revelation as being “tribal” and “in his bones,” he has become radioactive, meant to be shunned by the ultimate fall from grace. The contrast is striking. He is a broken man -- and the audience is left to deliberate whether there is any hope for the millennium old conflict of religious indoctrination and bias. It is stunning, powerful theatre. As J. Barry Lewis, the seasoned director of some 200 shows including many others at The Maltz as well as Dramaworks said “Disgraced focuses on the various ways each of us secretly continue to hold on to our tribal identities – our identities from birth, of our education – in spite of our various and ongoing attempts to enlighten our lives. We are products of the world we create, often finding safety in those tribal identities. 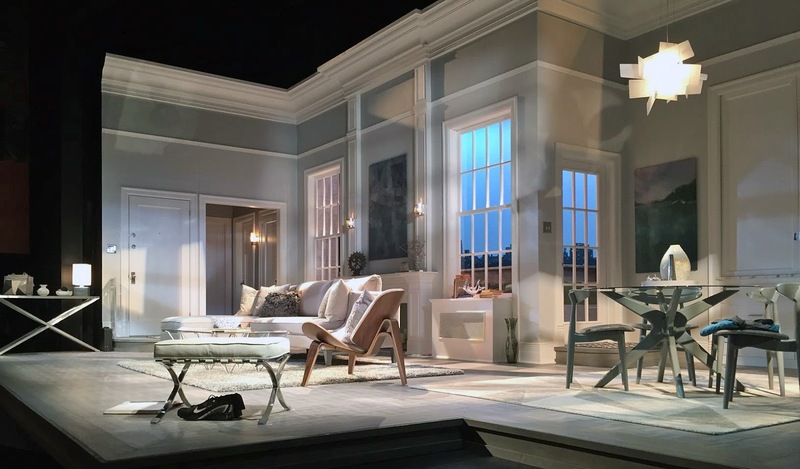 The play has been called 'an evening of cocktails and confessions,’ and it is certain to spark dialogue about our own contradictions.” Lewis skillfully brings those observations front and center utilizing a talented group of actors and technical professionals. In addition to Paul Black’s lighting, Lewis had Marty Mets’ skillful sound design, the opening scene overlaying Middle Eastern music with the sounds of the city below, segueing to the music alone during scene changes and then, again, the unmistakable sounds of the city when Amir angrily opens the door to their balcony, a reminder of the world from which he is suddenly ostracized. Leslye Menshouse’s costume design is chic, in keeping with the sophisticated early 21st century Manhattan professional environment, replete with Amir’s expensive dress shirts. The Maltz Theatre typically presents musicals, the majority of which are thoroughly outstanding. They have also presented some remarkable serious theatre, Red and Other Desert Cities to name just a couple. Seeing Disgraced there makes you yearn for more of these blockbusting dramas.